Technology Transfer | WINStep Forward | Connecting India and the U.S. The University of Wisconsin–Madison is among America’s leading research universities in science and technology. In order for this science and technology to benefit the general population on a local, national, and even global scale, productive results from research should be made available to the public sector and productive collaborations between academia and the private sector should be encouraged. 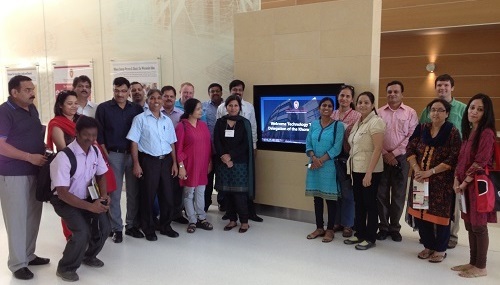 In a recent partnership with the Wisconsin Alumni Research Foundation (WARF), the Indian Department of Biotechnology (DBT), and the Indo-US Science and Technology Forum, the Khorana program initiated the development of a Tech Transfer Course for top policy makers from government agencies, academia, and industry. The aim of this 2 week program is to expose policy makers, academics, and industrialists to the various aspects of establishing technology transfer infrastructure which will allow innovative science based ideas generated in university labs to become successfully marketable. Successful collaborations with groups like agriculture equipment giant Mahindra and Mahindra encourage the Khorana Program to initiate further public and private partnerships between scientific communities in the United States and India – both academic and industrial. Past participants in this program have been forunate to work with the technology transfer cell at The Wisconsin Alumni Research Foundation (WARF). This foundation empowers University of Wisconsin researchers to commercialize innovative ideas originating in academic spheres into high return marketable products. As a result of WARF’s reinvestment into UW Madison research, WARF has returned more than $1.25 billion to the university and has built an endowment that is now worth about $2 billion. Click here for a list of WARF’s success stories. Launching the Alumni Boston Chapter! !